Event #15, the $10,000 Heads-Up No-Limit Hold'em Championship, began with 129 players. After 128 matches, only one emerged with an undefeated record. 22-year-old Adrian Mateos outlasted the field, capturing his third World Series of Poker gold bracelet and a $324,470 pay day. 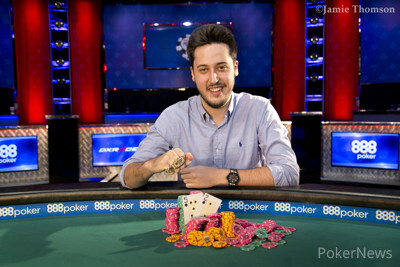 Now the youngest player ever to have won three bracelets, Mateos has earned himself a place in WSOP history. "It’s insane that I have three bracelets," Mateos said. "It’s really difficult to win three bracelets and I’m 22. I run good and I think I play good so that’s all that matters." Mateos added that this bracelet was a different experience because it was a special event. His previous two bracelets came in full ring no-limit hold'em tournaments. "There’s not many heads-up events in the year, but I really want to play," he said. "I was really focused for every round to win and I really like to play heads-up so it’s really fun." Mateos received a bye in the initial "play-in" round, and then defeated six-time bracelet winner Daniel Negreanu in the Round of 128. With a five-high straight showing on the board, Mateos held the absolute nuts with seven-six and bested Negreanu, who had initially flopped the wheel. His next opponent was Ian O'Hara, and Mateos scored a swift victory to advance to the Round of 32 the following day. His opponent to begin Day 2 was Eric Wasserson, and the winner would be guaranteed a min-cash. Mateos took an early lead in the match, and eventually sealed the deal when his pocket threes won a race against Wasserson's ace-queen. A Round of 16 duel with Taylor Paur followed. Holding the lead, Mateos got his chips in and trailed slightly with queen-jack against Paur's ace-four. However, two queens found the board and Mateos locked up a seat in the Round of 8. Fellow two-time bracelet winner Ryan Hughes was his next opponent, and Hughes had Mateos on the ropes early into the match. Down nearly 10:1 in chips, Mateos battled back in a big way. He doubled up four times, before his king-three bested Hughes' ace-ten. With that, Mateos punched his ticket to the Final Four. He faced off against Charlie Carrel, in what turned out to be a relatively fast 37-hand match. Mateos was trailing early, but found some momentum after picking off a bluff with king high. Three hands later, Carrel bluffed again and Mateos called for his tournament life with third pair. Now with a commanding chip lead, Mateos closed it out three hands later when his ace-king held up against ace-ten to earn a seat in the championship match. Awaiting Mateos was 70-year-old John Smith. The U.S. Army veteran and Purple Heart recipient finished runner-up in this event last summer and had become a fan favorite among the masses in the Brasilia Room. Mateos held the lead for a good portion of the match before Smith mounted a comeback in the mid-to-late stages. However, Mateos retook the lead and didn't relinquish it again. On the final hand with an ace-high flop showing, Smith got his remaining chips into the middle with queen high against Mateos who held straight and flush draws. A spade landed on the turn, locking up the victory for Mateos. Mateos said after the match that he was really impressed with the way Smith played in the match. "He plays really different from a lot of players but that worked for him. It’s really tough to play against him; he makes different plays every hand. He changed his game every hand. He’s really hard to read." For Smith, the plan is to keep playing the event he has had so much success in over the past two years. "I’ll be back next year. Unfinished business. Maybe I can get three seconds," he joked afterward. Hand #71: John Smith raised to 200,000 and Adrian Mateos folded. Hand #73: Smith limped in and Mateos raised to 300,000, which Smith called. The flop fell and Mateos continued for 200,000. Smith moved all in for what appeared to be around 1,300,000 and Mateos glanced over before calling. Both rails jumped up for the showdown. "Oh my god, he is ahead," Smith's rail said and asked for a queen. The Spanish rail shouted for spades and both wishes were granted with the turn. Smith was drawing dead and Mateos ran over to his rail and embraced everyone. In the meanwhile, the meaningless river completed the board and Smith was eliminated in 2nd place for $200,538. 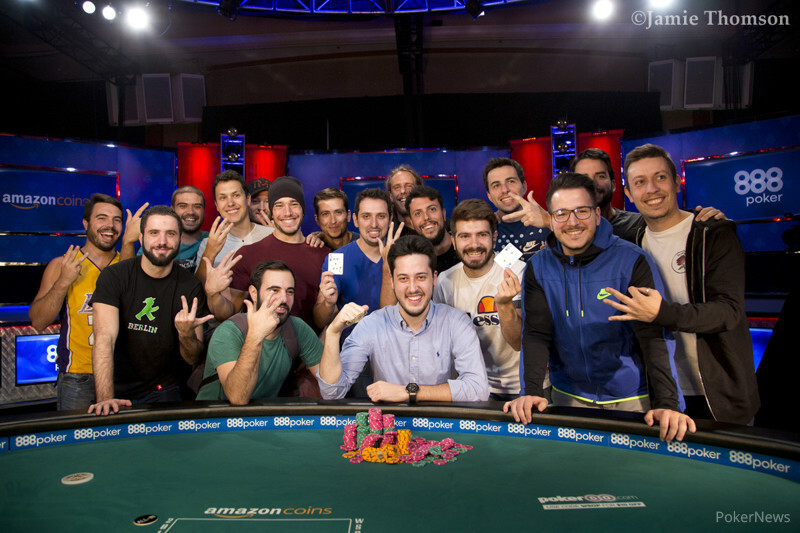 Mateos wins his third World Series of Poker bracelet and receives a payday of $324,470. A recap of today's action will be available shortly. Hand #65: Smith (with ) raised to 225,000 and Mateos folded. Hand #66: Mateos (with ) raised to 200,000 and Smith (with ) called. The flop was and Smith bet 425,000. Mateos called. The turn and river were checked by both players and Mateos won with his for a pair of kings. Hand #67: Smith (with ) raised to 160,000 and Mateos (with ) called. The flop was and Mateos check-called a bet of 250,000 from Smith. The turn and river were checked by both players and Smith won with for a rivered pair of fives. Hand #68: Mateos (with ) raised to 200,000 and Smith (with ) called. Smith check-folded to a bet on a board of . Hand #69: Smith (with ) limped and Mateos (with ) checked. The two players checked a flop of and the turn was the . Mateos bet 100,000 and Smith folded. Hand #70: Mateos (with ) raised to 180,000 and Smith folded. Hand #60: Adrian Mateos (with ) raised to 200,000 and John Smith (with called to see a flop of . Smith checked, Mateos continued for 130,000 and that won the pot. Hand #61: Smith (with ) min-raised to 160,000 and Mateos (with ) called. On a flop of , Mateos checked and Smith bet 225,000. Mateos called and check-called the very same bet of 225,000 on the turn. The Spaniard checked the on the river and Smith bet 225,000 once more. Mateos called and Smith mucked his cards to forfeit the pot. Hand #62: Mateos (with ) raised to 200,000 and Smith (with ) called. 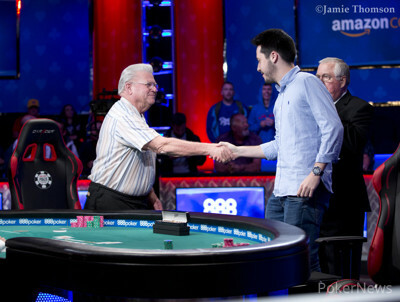 On the flop, Smith bet 250,000 and Mateos claimed the pot uncontested with a raise to 715,000. Hand #63: Smith (with ) raised to 250,000 and Mateos folded . Hand #64: Mateos (with ) opened to 200,000 and Smith (with ) called. The flop came and Smith checked, Mateos bet 130,000 and was called by Smith. The turn went check, check, and Smith bet the river for 310,000. After some consideration, Mateos folded and Smith stopped the run of his opponent. Hand #55: Mateos received a walk in the big blind. Hand #56: Smith received a walk in the big blind. Hand #57: Smith raised to 130,000 and Mateos folded. Hand #58: Mateos (with ) raised to 150,000 and Smith (with ) called. Smith check-folded to a bet from Mateos on a flop. Hand #59: Smith (with ) raised to 125,000 and Mateos (with ) called. The flop was and both players checked. The turn was the . Mateos bet 175,000 and Smith called. The river was the and Mateos checked. Smith bet 500,000 and Mateos called. Smith mucked and Mateos took down the pot. Hand #51: Smith (with ) limped and Mateos (with ) raised to 200,000. Smith folded. Hand #52: Mateos raised (with ) to 150,000. Smith (with ) three-bet to 500,000 and Mateos called. The flop came . Smith bet 500,000 and Mateos called. The turn and river were both checked. Smith showed his , Mateos showed his , and the pot was chopped. Hand #53: Smith raised to 175,000 and Mateos folded. Hand #54: Smith received a walk in the big blind. Who Will Win the $10,000 Heads Up No-Limit Hold'em Championship?